A preserved doorway at the foot of a stair-tower in Riddle's Court. The lintel bears the date 1726. 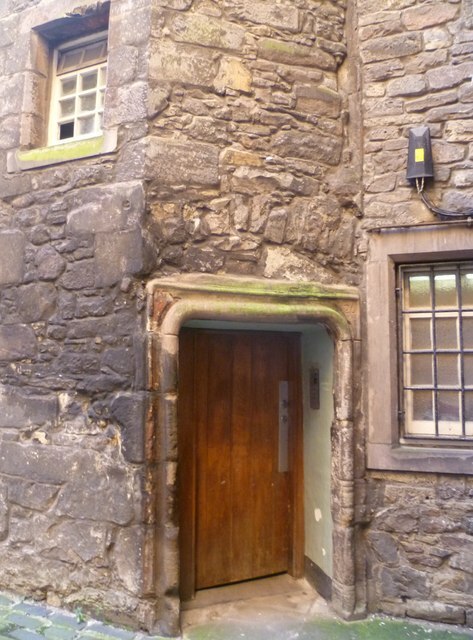 This was the entrance to the first Edinburgh home of David Hume, the celebrated 18th-century philosopher, whom some regard as the greatest figure in the history of Western philosophy since the Ancients. I'd love to know how many famous figures of the age crossed this threshold. Hume and his coterie were well known for their love of claret, oysters and conversation in the taverns of Old Edinburgh, and I suspect some of them stumbled through this doorway after many an evening of conviviality and carousing. Hume later moved to James' Court on the opposite side of the Lawnmarket. His house there, which was bought by James Boswell when Hume moved to the New Town in 1771, was destroyed by fire in 1857.